Gone are the days when printers were nothing more than devices to make the virtual words on your screen into reality. Now it's all about the added value, and few do it better than the Lexmark Interact. This top of the range printer not only prints, scans and copies, but comes with its own high-end capacitive SmartSolutions touchscreen on the front too for easy navigation through all the functions. Not only that, but you can also check out the latest news on the Interact as well, with the inbuilt Wi-Fi offering headlines from the likes of MSN via RSS. If you want to check out your photos as well, the Interact is packing a memory card socket taking SD, MemoryStick and xD cards, and the PictBridge socket doubles to accept USB drives as well. 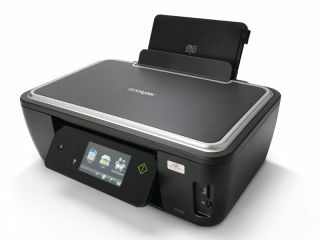 What's more, TechRadar has two of these great printers to give away to lucky readers. This competition is now closed. The winners are Andrew Patonpaton and Martin Stenner.